Late last year when Forrester announced a wave for "Digital Experience Platforms," we took them to task for favoring vendor hype over the interests of you the customer. Now that Gartner has delivered a similar quadrant, let's once again review the key issues from your viewpoint. For publicly-traded or late-stage venture-funded vendors, investors become more important constituents than customers. Lately investors have been looking for "greater share of wallet" and vendors have been falling over themselves to show that their cross-selling strategies are working. The latest incarnation of this is "DXP," which can be defined in different ways, but typically entails some sort of hybrid Portal/CMS/DAM/Ecommerce/Personalization platform or collection of tools. Not every self-styled DXP offers all those services, let alone within the same product, but you get the idea. And it's a crazy idea (more about that below). 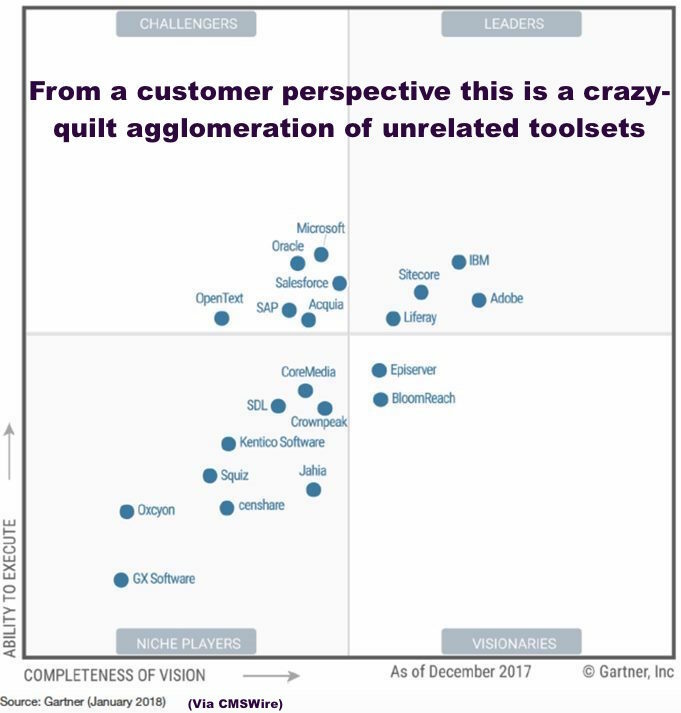 Gartner plays an outsized role in this process by fawning over the institutional demands of its largest vendor customers pushing this concept. At a high level this is an agglomeration of WCM, DAM, Portal, and Personalization vendors and tools. Some are single products; some are huge, unweildy suites. And what a bizarre potpourri of vendors and products. For starters, you should be suspicious any chart that has both Salesforce and Squiz or Kentico and SAP together. If you are looking at Sitecore and Liferay to solve the same problem, you should revisit your requirements or your vendor shortlist, or both. There is no marketplace here, because no enterprise digital leader in her right mind would actually purchase "digital experience" as a platform. DX is a strategy and approach, and no single platform or vendor on this chart will get you there. First, be prepared for a lot of "selling up the chain," as large vendors try to persuade your boss that your reluctance to buy all their tools is somehow non-strategic. Real use-cases and business plans become your friend here. Every year I talk to hundreds of digital leaders. Sometime you and I should discuss the various characteristics that accompany more successful digital strategies. But for now, let's just review one attribute: a rigorous approach to adopting best-fit technology, following a clear separation of concerns, to make sure digital teams have the right tools to execute on the organization's ambitions. This takes discipline, a preference for integration over customization, and a clear understanding of the nexus of internal and customer usability. It does not take a "digital experience platform." "There is really no comparison between the level of detail and insight I find in the Real Story Group publications and other resources. Why is The Web CMS Research so good? First, Real Story Group avoids fads and takes a very measured, grounded analysis of changes going on in the web marketplace. Second, Real Story Group evaluates solutions holistically, looking at more than the software itself and considering the vendor's business viability. Third, Real Story Group can't be beat for having a conceptual grasp of what is really important in these products, and how they actually get deployed, from small implementations to enterprise scale. It's this thorough, totally grounded perspective that makes Real Story Group research an indispensable tool in my business." John Berndt, President and CEO, The Berndt Group, Ltd.